It was an unexpected feeling, late that Wednesday night, just as the clock struck 10:48. A damp, rather chilling feeling. Somewhat sandy. It was at that minute of 10:48 that I realized that my left spigot handle was no longer stoically attached beside it’s right-hand partner, but was clenched uselessly inside my left hand. 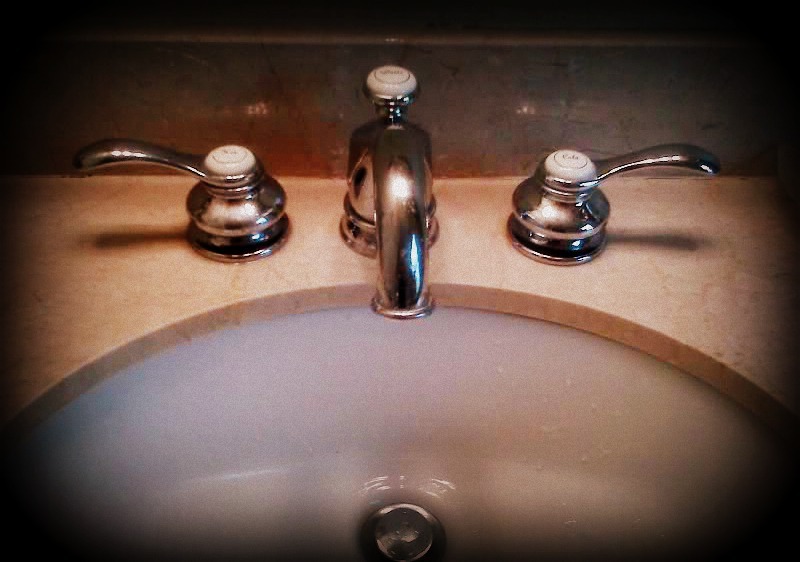 My innocent bathroom sink had become a vehement geyser, and was spouting frigid gritty water onto everything within a five-foot radius. A cheerful window-marker maxim wept blue trails of sorrow down the length of my mirror as spray engulfed it in bounding spurts. A black-and-white visage stared down at me from the dresser, enduring splash after splash in the face with a never-flinching grin, but making no move of assistance as I scurried about in distress. I discovered a very important fact that energetic night. There is no valve under the sink. Or anywhere else, for that matter. 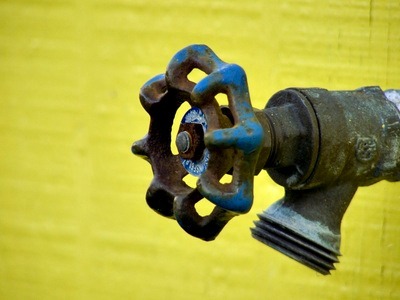 I also found out that a 1-inch pipe can spout out quite a bit of water in a minute’s time. Enough to creep in peaceful ripples towards my bedroom carpet without even a second thought. Unfortunate events often collaborate, because there is beauty in numbers, I guess. Either way, when your abode is filling with murky water, and the options for resolutionary action are non-existent, it is a very unfortunate time for your phone to be out of service. It is also a very unfortunate time to be barefoot, in pajamas, with wet hair dripping in your face. It is an unfortunate time to scurry about a dark campus searching for phone service… or at least a conscious ear. It is an unfortunate time for the temperature to be twenty degrees Fahrenheit. I thought with clenched jaw, and since my attempts at fight had done nothing but sog up every soluble item in the house, and the still-gushing water was speedily transforming my room into an indoor water park, flight was the only option. My bare toes bounded across frigid rocks of the pathway as I searched for service, and I had the horrifying thought that my phone’s five remaining minutes of battery might die before I could reach someone. They did not. I had three minutes to spare when I heard a voice on the other end of the line. Turns out, the valve was in another building entirely. Problem solved, I returned to my soggy room, sat down on the bed, and laughed. And that applies to a house. Now, where is the main power control?